Resisting Stereotypes and Bans: True then, Truer now. Dealing with hate-think and discrimination is familiar turf for many pit bull owners. We’ve become pros at navigating situations where fear-based judgment can pose real threats to our canine family members. 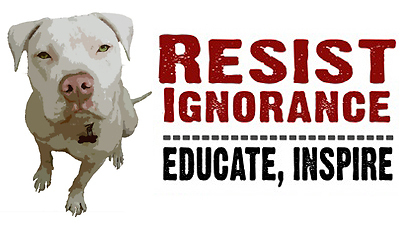 We fight breed bans by wearing thick skins and arming ourselves with facts to help educate, and we participate in creating effective animal laws and policies that reflect contemporary science while embracing canines as the individuals that they are. 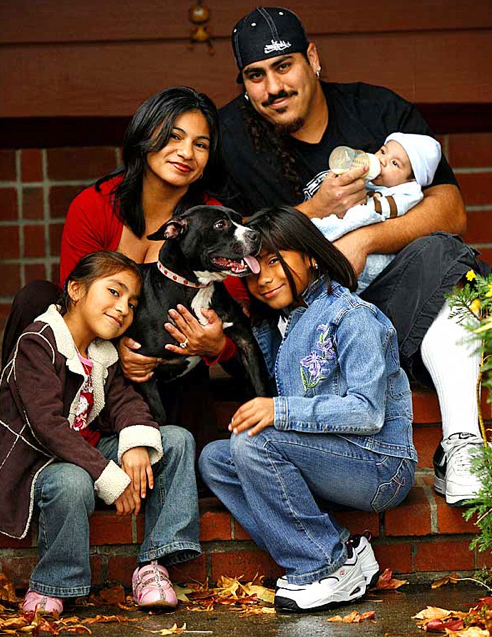 The animal welfare community as a whole has done beautiful work to disarm the stigmas and stereotypes attached to blocky headed dogs, and trends are swinging towards game changing Owner Support programs that are fueled by empathy for families in our communities. We’re evolving … At least in some corners. In recent months, some of our rescue partners have been hit with a different form of stereotyping crisis in their personal lives. As animal advocates, they’ve been heroes. But as immigrants, they’re in the crosshairs of dangerous ideologies of people who condemn their religion, home countries and/or skin color. Who knew we'd see efforts in our country to ban humans based on nothing but their parentage? These trends are so un-American that it seems unbelievable that this is surfacing as a topic on our blog today - but once you see the parallels, you can't un-see them. In the interest of inviting a broader dialogue that takes the lessons we’ve learned from pit bull advocacy to a new level, we’re sharing the viewpoints of three valued rescue friends. 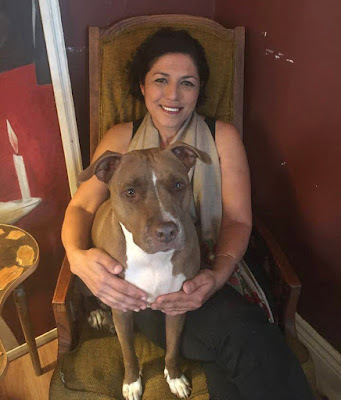 Freba Maulauizada was a pit bull owner (shown with Ariel), a shelter volunteer, a dog rescuer and a vocal city activist who went to bat for Oakland Animal Service’s budget and program needs when we met several years ago. She still rescues dogs in Louisiana where she now lives with Tammy Murray, her life partner of 16 years. I have all the strikes against me. My name is Freba. I am from Afghanistan. I am a woman. I am Muslim and I am also gay. I now live in a red state. Well, one can just imagine how I feel. I feel like a pit bull. All odds are against me. But just like a pit bull, I like to make sure that other’s ignorance will not belittle me. by being a shining example of my Roots. Berenice Hernandez is longtime BADRAP team member. 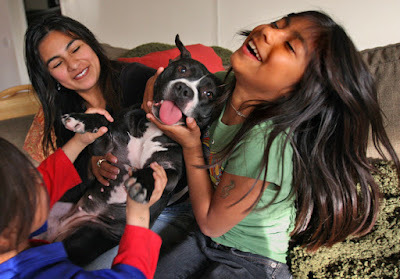 ‘Zippy’ - one of the celebrated survivors from M. Vick's dog fighting operation - found a home with their family ten years ago. This is what Berenice wants you to know about being an immigrant in today’s America. "I walked into a local sandwich shop to pick up lunch before I headed to work; it was a few days after the elections. I noticed the young girl helping me had different energy than usual. I, having a heavy feeling, ask her how she is holding up. She looks at me with a sigh of relief and says “as best as I can, given the situation.” She tells me how someone with a Trump button had come into the shop and told her she had voted for him to get rid of people like her. The young girl told me that this wasn't her first encounter with someone like that. This girl of Mexican descent was born here, in this country. We talked for a bit about our fears, our worries and also our strengths. I understand that not all Trump voters feel this way. I know that. I really do. However, my sense of safety and trust is affected by hearing these words. Complete strangers hating on you without knowing you, sure makes you feel uneasy. I am an immigrant. I have lived in this beautiful country for over thirty years. I am proud of my heritage, as I am proud to be an American. I wasn’t born here but I worked hard to become an American citizen, to adopt this country as my own. My parents have worked hard to build a life for them and their children. My mother escaped a civil war in El Salvador (worth looking it up for details). She is a business owner, my father a Postal service worker for over 25 years. I have built a family here. I have a job here. 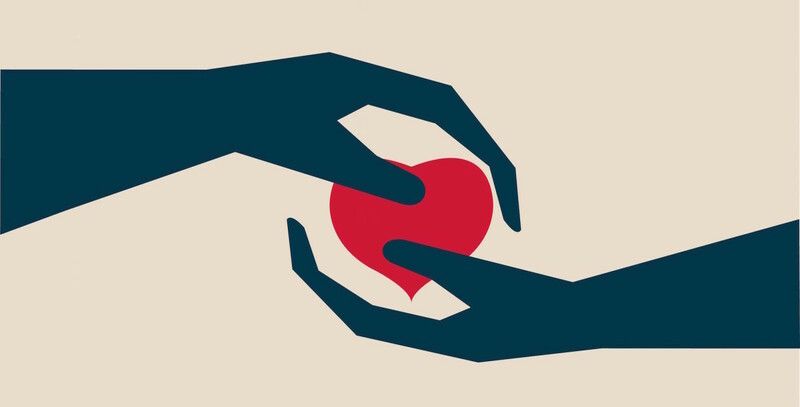 I have volunteered my time and money to organizations. My children were born here. My husband is second generation Chicano, part Native American (Yaqui). His family lived in New Mexico when New Mexico became part of the U.S. I am a volunteer, an advocate for animals. I have spent time educating against Breed Specific Legislation. I have met with politicians to advocate for our beloved misunderstood dogs. I became involved with Pit Bulls 17 years ago, when a 4 week-old pit mix landed in my hands. She needed my help, so I stepped in. I had no clue that I would learn so much about people’s biases. After all, I had no idea what a pit bull was. All I saw was a dog that needed help so I helped her. Over the last 17 years I have had my share of foster dogs, some which have ended up as permanent family members. Back in 2007, I ended up with a new foster, this foster was different though. Not because she was different as a dog but because of her circumstances. 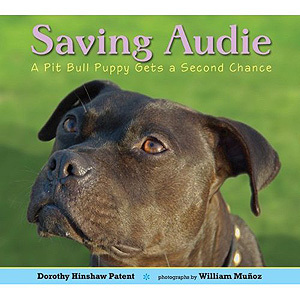 As you know, before the Vick dogs, all fight-bust dogs would be euthanized. Automatically labeled and fate sealed. We have learned many lessons from the Vick case. An accomplishment we can celebrate because barriers were broken. These dogs once viewed as vicious, now exposed for the world to see. They are now seen as what they have always been: just dogs. Dogs victimized by greed. I am a mother. My children know what it’s like to not be able to have friends over because the parents don’t approve of our dogs. My children have shed tears because they just didn’t understand how someone who didn’t even know our dogs could have such fears and dislike for them. They learned from a young age a lesson about labels, exclusion and misunderstanding. They have also learned to have empathy, sympathy and compassion, not only for dogs but also for the misplaced fears of people. My two oldest daughters are now 17 & 14. Sadly, they have been experiencing those same feelings lately. They have been told that Trump will build a wall to keep people like them out of “our country”, they have seen confederate flags displayed from the back of pick up trucks in their school parking lot. They have had to stand up to friends because those friends have made hurtful comments regarding the immigration ban. This ban affects family of friends they know. While my children understand that comments like these often come from a lack of understanding, they refuse to accept that saying such things should be okay. Think about times when you have been made to feel like you don't belong simply because you didn't speak the language, or you wore the wrong outfit or you walked your big dog down the street and people were scared. I know, in some ways these don’t compare to what we are experiencing these days but you get the idea. This is how some of us are feeling right now. Anger, fear, lack of information hurts people. For my fellow immigrants, I want you to know you are not alone. You belong here, I belong here, our families belong here, and our dogs belong here! Here in America! We are a nation of love, understanding and compassion. I truly believe that. To those who may feel that immigrants as a whole are a threat to you, look around. Look at people like me, my family. We are hardworking, good-hearted people, advocates, just like you. We want better for our children and the world. Just as we unite to do right by animals, fight battles like BSL, fight-bust victims and dedicate our time to better the life of animals and people, I ask you to please stop for one minute and practice empathy for all humans. Photo top: Carol Guzy for the Washington Post. Second photo: Deanne Fitzmaurice for Sports Illustrated. 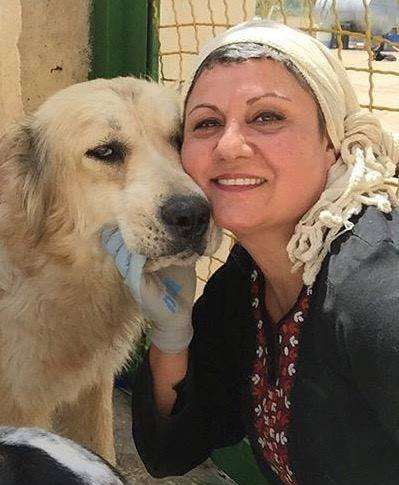 Farah Ravon adopted BADRAP dog ‘Rosie’ when we were still a young org. 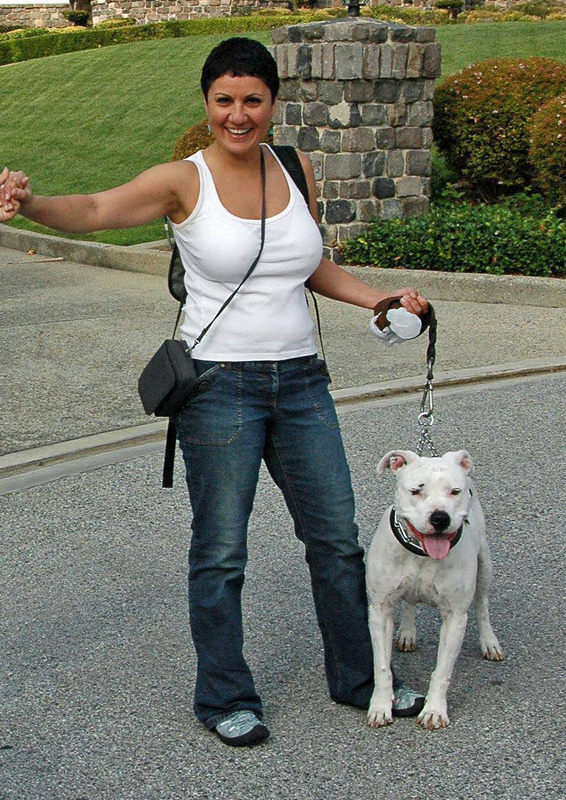 She later became a key US-based support member for one of our favorite animal initiatives - Vafa Animal Shelter. Vafa is a brilliant, non-governmental organization that was created to protect animal rights in Iran. Iranian-Americans among others are critical to Vafa’s ability to save lives. They bring supplies with them when they visit, and chaperone one or more dogs back to waiting US adopters when they return home. As you can imagine, traveler bans will have a devastating effect on this struggling animal shelter. "My name is Faranak, aka Farah, and I am an Iranian-American, but I am more than just an Iranian-American; I am a daughter, a wife and a sister. I define myself most strongly as an animal rescue worker. I left Iran when I was 12 and have lived in the United States the majority of my life. This country has always been my second home. Suddenly all of that has changed. Suddenly I feel like an outsider, like I don't belong. I am confused, scared and feeling helpless. My friends and family are also confused, scared, and feeling helpless. The rescue work I have done over the last 15+ years has opened me up to the beauty and diversity that is the United States. I am proud to say there are many more Iranian-Americans just like me, who also love and rescue animals. The travel ban has not only impacted the lives of human beings from Muslim countries, it has already had a damaging impact on our ability to help animals who are desperately in need. We depend on kind souls traveling in and out of the country to accompany our dogs and cats to the United States. Without them, our efforts would fail. Because of the ban, there is a very real possibility the people who have volunteered to do this work will be detained at the airport. As a result, our dogs might have to spend 48 hours or more in a crate. Sadly, this is not simply a hypothetical scenario. Just last week we made the very difficult decision to postpone a rescue because of these circumstances. How many people traveling to the states, even citizens, will be willing to assume the risk and added stress of accompanying a dog when they might be subjected to delays? How many dogs will suffer? I speak to you now as one animal lover to another. We can agree, the intense love and loyalty of an animal has no bounds, sees no color or race. All that is required to feel these truths as a human being is an open heart." Talk to us. We welcome respectful, non-inflammatory comments.